Banksy spent the last month in New York; and during that time his artwork was stolen, destroyed, and even sold on the street for $60. In one neighborhood, shady locals covered his work and charged admission to people who wanted to take a gander at the fresh artwork. Banksy feels like a modern day superhero: his identity is unknown to everyone, he leaves his marking in places his visited, People are trying to capture photos of him in action, he breaks the law for “good”, and even scales buildings at night (I think he uses a ladder). He has even had rivals, King Robbo, another street artist, feuded with him for years in a “graffiti war” in which the two exchanged licks in the form of covering up each others works. If we are to think of Banksy as a superhero, the question is: what would happen if his identity was revealed? Would people from Team Robbo hunt him down? Would he be wanted for the crimes he’s committed? Or would people stop caring about him? 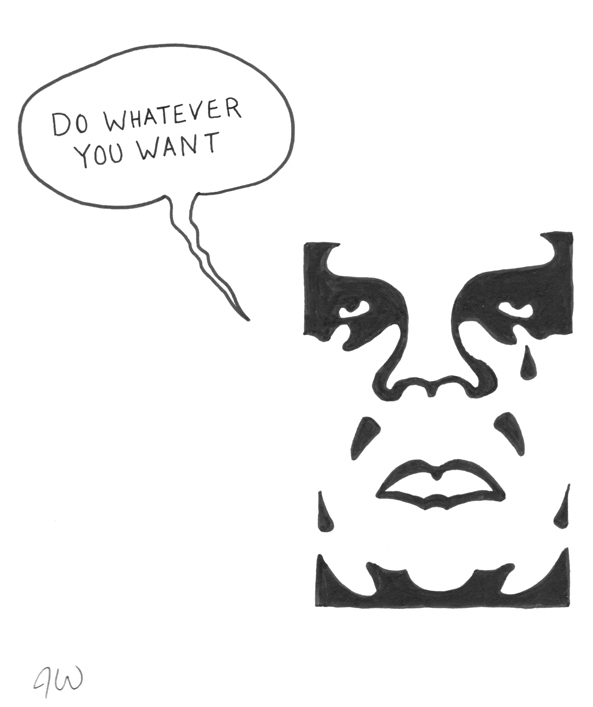 Shepard Fairey, another artist known for his iconic OBEY image parodied above, has his identity widely known and his career has flourished in recent years (other than being arrested in 2009). He makes images for clothing and designed art for an Led Zeppelin album. In fact, I’d argue that his famous “Obama Hope” image is more well known than any of Banksy’s images. Yet, for some reason people seem to care about Banksy more. The populous simply loves the mysterious character more (just like in all those teen romance novels). He’s not just another artist, he’s a mystery. People have claimed they know the identity of the enigmatic artist, but honestly I, as well as many others, probably don’t want to know who he is, at least not yet. I think much of Banksy’s draw is that he is so unknown, and perhaps it should stay that way or else his appeal might become as temporary as his physical art is. This entry was posted in Uncategorized and tagged Banksy, Graffiti, King Robbo, New York, Obey, sadsadsad, Shepard Fairey, superhero. Bookmark the permalink.